Led by historian Emanuel Ringelblum and known by the code name Oyneg Shabes, this clandestine group vowed to defeat Nazi lies and propaganda not with guns or fists but with pen and paper. Written, produced and directed by Roberta Grossman, based upon the book "Who Will Write Our History?" 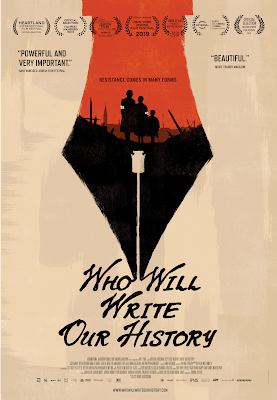 by Samuel D. Kassow, and executive produced by Nancy Spielberg, "Who Will Write Our History" mixes the writings of the Oyneg Shabes archive with new interviews, rarely seen footage and stunning dramatizations (shot on location in Lodz and Warsaw, Poland) to transport us inside the Ghetto and the lives of these courageous resistance fighters. Featuring the voices of three-time Academy Award nominee Joan Allen and Academy Award winner Adrian Brody, the film honors the Oyneg Shabes members’ determination in creating the most important cache of eyewitness accounts to survive the war. It follows their moments of hope, as well as their despair, desperation and anger, sometimes at their fellow Jews as much as their Nazi captors. It captures their humor, longing, hunger and their determination to retain their humanity in the face of unspeakable hardships.